This is always a fun exercise that doesn’t really return a whole lot. It’s more of a way to get a glimpse into the future and see how things might shake out down the road. Three out of eight, with four of the nine players still with the organization. Not that bad, I’d say. Player’s season-age will be in parenthesis. This exercise also does not take into account potential trades or free agent signings, so you’ll see no Bryce Harper prediction below. I know it’s unrealistic to think the Dodgers won’t venture outside the organization for talent, but this is not that kind of post. So many quality options. No org can match this. Austin Barnes (31): He’s one of the top catchers in the org, but his skills might be better served at another position. 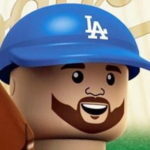 Yasmani Grandal (32): Doubt the Dodgers re-sign him following the 2018 season. Kyle Farmer (29): While he has improved in the last couple years, he still profiles as a backup … if he’s still in the org. Keibert Ruiz (22): His ceiling is almost limitless; should be an All-Star for many years. Will Smith (26): He’s probably the best defensive catcher in the org with an intriguing bat. Connor Wong (25): Even more athletic than Barnes or Smith and could end up at another position. Ruiz was my No. 2 prospect, and in three years he’ll be more than ready for the big time. He has incredible makeup and work ethic, is improving behind the plate and could be a force offensively. This wasn’t easy as I’m high on Smith as well. Perhaps Smith will be the backup in this scenario, but the Dodgers have an embarrassment of riches behind the plate. This one is pretty cut-and-dry. Cody Bellinger (25): After an incredible rookie campaign, Bellinger should be one of the team leaders by 2021. Edwin Rios (26): Has among the best raw power of any minor-leaguer in the system, but he’s limitied defensively. I didn’t even give anyone else a chance because Bellinger could very well be an MVP-caliber player by this time and should be in the org for many years to come. Plenty of players to choose from here. 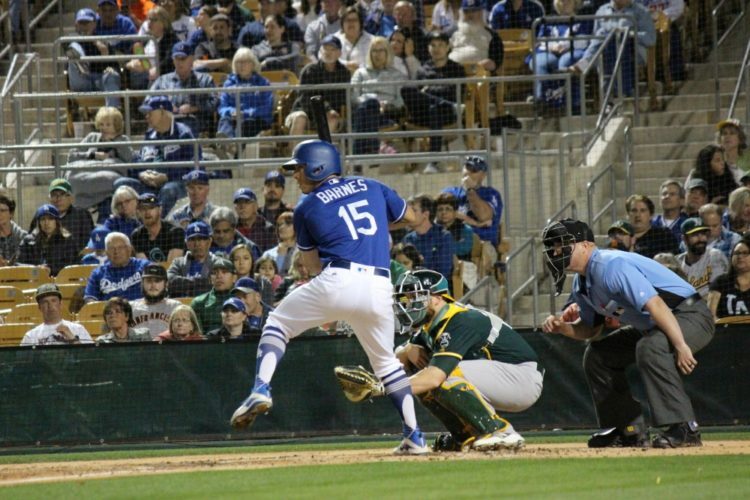 Austin Barnes (31): His ultimate home might be at second base; not a free agent until after 2022. Omar Estevez (23): Youth is on his side, but he took a step back with the bat in 2017. Logan Forsythe (33): Would require being re-signed to a long-term deal, which doesn’t seem likely. Enrique Hernandez (29): He’s a free agent after 2020, so if the Dodgers think he’s a starting-caliber second baseman, they’re going to have to pay for him. Jake Peter (28): Profiles better as a utility player at the MLB level rather than being locked into one position. Barnes’ bat is too valuable to not have in the lineup. And with plenty quality options behind the plate, he might be the long-term future as the org’s second baseman. Who’s going to replace JT? Matt Beaty (28): A darkhorse candidate to claim this spot; has good contact ability and a decent glove. Cristian Santana (24): Sleeper prospect of sorts for me; he could boom at third base, if his approach improves. Corey Seager (27): Dodgers would have to acquire premium/develop a shortstop to move Seager to third. Justin Turner (36): His deal ends after 2020, so the Dodgers will have had to re-sign him. He might be the new Baseball Dad at this point. Santana is the org’s best third base prospect and, looking at the rest of the lineup, the Dodgers could afford to have a youngster at this position, provided he plays defense well enough. Going to be hard to displace the face of the franchise. Ronny Brito (22): One of my favorites; would be great for him to claim this spot, but it’s unlikely. Gavin Lux (23): The 2016 1st-rounder would have to perform incredibly well over the next two seasons to have a chance. Drew Jackson (27): Lots of talent, but hasn’t put it all together just yet. Errol Robinson (26): Defense is his calling card and might be a better bench player. Corey Seager (27): He’ll be in the last year of arbitration. Here’s hoping he’ll be locked up by then (he won’t). Seager, as long as he’s healthy, should still be able to man shortstop by this time. And considering it’d be a contract year, he’d want to show he’s still valuable at the position. Oh, and he should be one of baseball’s best hitters at this time. Yusniel Diaz (24): Predicting a big 2018 for him; could be MLB-ready by 2019. Joc Pederson (29): Is a free agent after 2020, so keeping him around would require a long-term deal. DJ Peters (25): Big ceiling, but also considerable risk with him. Chris Taylor (30): Could shift from center field to accommodate a better defender. Andrew Toles (29): Still factors into the team’s plans; free agent after 2022. Alex Verdugo (25): The team’s best pure hitting prospect; could be trade bait or key contributor. In a short time in 2017, Taylor was a premium defender in left field. He’s been good in center field, but the Dodgers have another player better suited for center, which means left field would get a substantial defensive boost. Toles could be Taylor’s backup/platoon partner. If not Taylor, then who? Yusniel Diaz (24): Has the ability to play center field, but might be better in a corner. Jeren Kendall (25): 2017 1st-rounder is the best defensive outfielder in the org. Joc Pederson (29): Probably won’t be a center fielder by this point. DJ Peters (25): Can probably handle center in a pinch or part-time basis, but his bat will also determine where he plays. Chris Taylor (30): Should move aside for a younger, better fielder; won’t lose a starting role, though. Alex Verdugo (25): Center field in a long-term capacity was always a bit of a stretch for Verdugo. As long as the Dodgers can get his swing ironed out enough, Kendall has 1st-division ability in the field and on the bases. This is all predicated on that fact Kendall learns to hit enough to be an every day player — or at least a platoon player. Yusniel Diaz (24): Doesn’t have the power of a typical right fielder, but has plenty of hit and defensive ability. DJ Peters (25): Big power and arm would play in right field, if he hits enough. Yasiel Puig (31): A free agent after 2019, Puig would have to be in the second year of presumably big-money deal. Alex Verdugo (25): Could make for a nice platoon with Diaz, if nothing else. This could go either way — Verdugo or Diaz. I’m not sure the Dodgers will invest big money into Puig, and if the luxury tax is still a concern at this point, having cheap, productive players to take the place of pricey veterans could be neccesary. There are some players above who didn’t get the starting nod (Diaz, Smith, Toles), but they should factor into the roster, provided they’re all still with the organization. And if you’re not a fan of slotted Kendall into center field, then the easiest solution would be for Taylor to move back there with Diaz and/or Toles slotting in as the left field platoon. Either way, there’s still a ton of talent up and down this organization.